Gautam Navlakha was arrested by Maharashtra Police on Tuesday along with four other Left-wing activists for alleged unlawful activities. 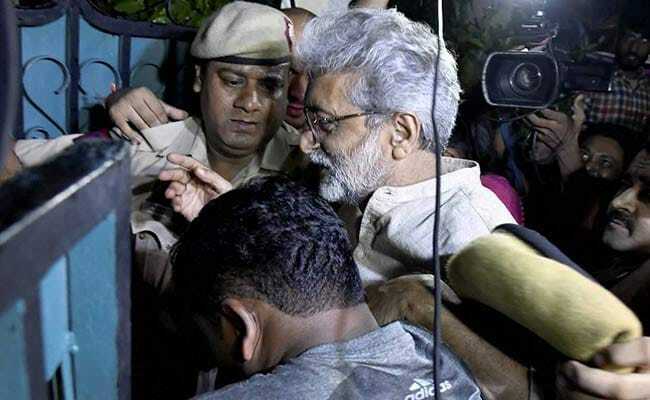 Civil liberties activist Gautam Navlakha, arrested for suspected links with Maoists, on Wednesday alleged that the case against him was a "political ploy" of the government to target dissent. The Delhi High Court had ordered that he be confined at his residence in Delhi. "The entire case is a political ploy against political dissent by this vindictive and cowardly government, which is bent upon shielding the real culprits of Bhima Koregaon and thus divert attention from its own scams and failures which stretch from Kashmir to Kerala," Gautam Navlakha said in a statement issued by the civil rights group People's Union for Democratic Rights of which he is a part. "A political trial must be fought politically and I welcome this opportunity. I have to do nothing. It is for the Maharashtra police, working at the behest of their political masters, to prove their case against me, and my comrades who too have been arrested," he said. "Now I myself will be a witness to a political trial with a ringside view," he said and also tagged a revolutionary song, "Tu zinda hai toh zindagi ki jeet par yakeen kar...", often sung by Leftists. Telugu poet Varavara Rao and activists Vernon Gonsalves, Arun Ferreira, trade unionist and lawyer Sudha Bhardwaj and Navlakha were arrested on Tuesday after multi-city searches. The near simultaneous raids against the five as well as four others were carried out as part of a probe into the violence between Dalits and the upper caste Peshwas at Koregaon-Bhima village near Pune after an event called Elgar Parishad, or conclave, on December 31 last year. Provocative speeches were made at the Elgar Parishad event, which triggered the violence, according to an FIR registered at the Vishrambaug police station in Pune after the event. Varavara Rao, Sudha Bhardwaj, Ferreira, Vernon Gonzalves and Gautam Navalakha were arrested under IPC Section 153 (A), which relates to promoting enmity between different groups on grounds of religion, race, place or birth, residence, language and committing acts prejudicial to maintenance of harmony, an official said. There were also arrested under some other sections of the IPC, along with Unlawful Activities (Prevention) Act for their "alleged Naxal activities", the official said without elaborating.